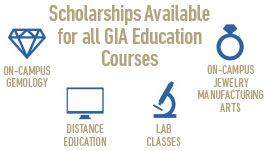 Why Study at the Gemological Institute of America? Receive more information on GIA Education programs – delivered right to your inbox. Thank you. More information about GIA Education is on its way. Is a Career in the Gem and Jewelry Industry Right for Your Student? The gem and jewelry offers countless opportunities: gem analysis; sales; appraisal; quality assurance; the design, manufacturing and repair of jewelry; field gemology and much more. Qualified professionals can pursue careers at large and small companies, as a freelancer, or as an entrepreneur starting their own business. Yet, because of cultural practices, relatively little of the historic jewelry exists, the gems and precious metals repurposed by succeeding generations. The jewels in “Centuries of Opulance: Jewels of India,” which will be on display in Carlsbad until March 2018, are on loan from a private collection and showcase more than 300 years of adornment in India from the 17th to the 20th century, including several from the magnificent Mughal Era (1526–1857). Sir Yadavindra Singh, Maharaja of Patiala, is seen here wearing a fortune in jewelry, including two necklaces that Cartier created for his father in 1928. Reprinted with permission from the Cartier Archives, © Cartier. In fact, it was a thirst for the fabled riches of Northern India that drew Babur, the Muslim founder of the Mughal Empire, from Central Asia. Lavishly adorned with the jewels they had won, received as “gifts” or created from the vast stores of gems and gold in their treasuries, the Mughals and other rulers of India continued to honor the religious, metaphysical and social importance of the precious materials and the forms they took. Intricately designed pieces celebrated Allah and Hindu gods, such as Shiva, Krishna and Vishnu. Other jewels were integral to the marriage contract, as seen in the elaborate wedding necklaces, in depictions of snakes or fish as symbols of fertility, and in nose rings worn as testament to happiness in the union. Brightly colored gems and enamel symbolized the forces of life: red as blood, the life force of the animal kingdom; green as the plant life created by the blue sky combined with the yellow sun. To this day in India, gems and jewelry carry potent messages of power, honor and love. Gem and Jewelry Sales: Many careers involve the buying and selling of fine gems and jewelry. This could be through wholesale or retail, online or in a physical store. You may start your own business, work for a multi-national company or small specialty firm. No matter the career, a solid gem and jewelry education is a key factor to career success. Jewelry Design: Today’s tools and technology have taken jewelry design to a new level. The design process may start with a discussion with a client and hand sketches, then move to computer-aided design and manufacturing (CAD/CAM) to refine the final design. Jewelry Manufacturing and Repair: Sizing a ring, setting the perfect gemstone, refurbishing an antique piece or putting the finishing touches on a custom-designed ring requires an understanding of jewelry engineering and the latest manufacturing technology. Your GIA classmates will become an important business network. 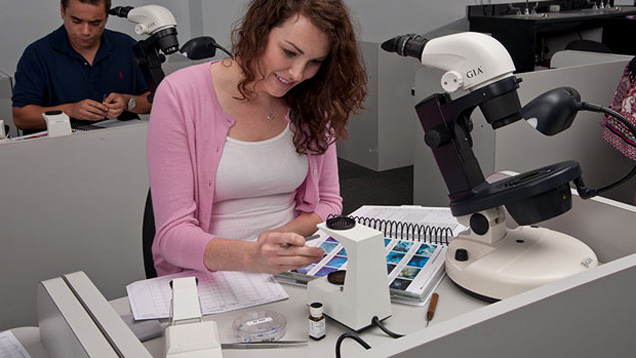 A diploma or certificate from the Gemological Institute of America® (GIA) can help provide the essential knowledge and practical skills for a diverse range of rewarding and exciting careers in the gem and jewelry industry. GIA credentials are respected by gem and jewelry professionals around the world and represent the highest standard of education in the fields of gemology, jewelry design and jewelry manufacturing. A GIA education is an ideal option for high school graduates, U.S. military veterans and those looking to change careers. A college degree is not required to enroll. Prospective students must have a high school diploma or its equivalent, and most campuses require English fluency. GIA® is the world’s foremost authority on diamonds, colored gemstones and pearls. Established in 1931, GIA is a public benefit, nonprofit institute, and is the leading source of knowledge, standards and education in gems and jewelry. An accredited*, post-secondary educational institution, GIA offers professional credential programs in gemology, jewelry design and jewelry manufacturing at seven schools: Carlsbad, California; New York; Bangkok; Hong Kong; London; Mumbai and Taipei. The Institute offers two learning options for gemology programs: on-campus or Distance Education. Jewelry design and manufacturing courses are available only On Campus. GIA students and alumni can also take advantage of education and career support services. This includes financial assistance and scholarships to those who qualify, housing assistance, social activities, assistance with special needs, GIA Career Fairs and a large, active and international alumni association. Taking a 5-day lab class an a good way to learn if a career in gems and jewelry may be right for you student. Here are some ways prospective students can decide if a career in the gem and jewelry industry is right for them. Diamond Essentials, Colored Stones Essentials or Jewelry Essentials eLearning courses are a good introduction to the key subjects taught at GIA. eLearning courses are self-paced with generous completion time limits and can be accessed from anywhere with Internet access. 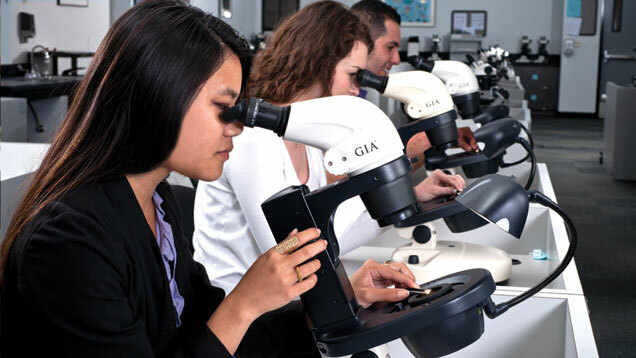 GIA offers on-campus, hands-on lab classes on diamonds, colored gemstones, pearls and jewelry repair. They are an excellent way for prospective students to work with gems, jewelry and common tools. This can help them determine if working with gems and jewelry is a good fit for them. Classes are five days or shorter, depending on the topic. Studying on a GIA campus is a unique experience. You’ll study with experienced instructors, receive individual attention and be immersed in the subject matter. GIA offers full-time, on-campus programs that run from seven to 26 instructional weeks. Year-round start dates make the programs ideal for students taking a gap year or for those who want to study during summer break. Students learn in modern classrooms with industry-standard gemological and jewelry manufacturing equipment, design software and 3D printers. Class sizes are small – typically 15 to 24 students – ensuring students receive individual attention. Many GIA campuses, including campuses in the United States, have a diverse, international student body. This creates a multicultural experience and gives students a global perspective on the industry. Another important part of student life are organized activities that enrich the learning experience. Examples of these include field trips to mines and manufacturing centers, guest lectures and social events. Earn a GIA credential with the flexibility of completing much of your coursework at home. Distance Education is ideal for individuals who need flexibility to meet family and job commitments. 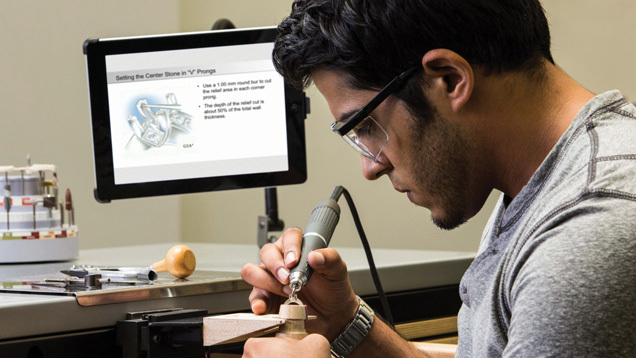 Stand-alone eLearning courses, or a combination of eLearning courses and on-campus lab classes allow students to earn various gemological diplomas while completing much of their coursework at home. Graduate Gemologist – One of the most sought-after credentials by employers in the gem and jewelry industry, this diploma program delivers a comprehensive gemological education on diamonds and colored gemstones. Offered on campus or through Distance Education. Graduate Diamonds – Learn essential information about diamonds, including diamond grading. Offered on campus or through Distance Education. Graduate Colored Stones – Learn to identify and evaluate more than 60 species of gemstones including emeralds, rubies and sapphires. Offered on campus or through Distance Education. Graduate Pearls – Learn the grading skills needed to buy and sell akoya, South Sea, Tahitian and freshwater pearls. Offered through Distance Education. 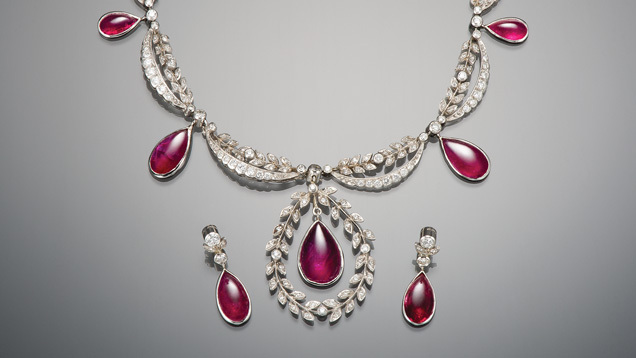 Applied Jewelry Professional – Learn about gems and jewelry in three eLearning courses. This program covers essential knowledge about diamonds, colored gemstones and jewelry. It’s also a great introduction to the world of gems and jewelry. Offered through Distance Education. Jewelry Design & Technology – Learn to design and prototype custom jewelry with computer-aided design and computer-aided manufacturing tools used by professional designers. Offered On Campus in Carlsbad, CA and New York. Graduate Jeweler – Learn the bench skills needed to become a professional jeweler, including making and repairing fine jewelry. Offered On Campus only in Carlsbad, CA. 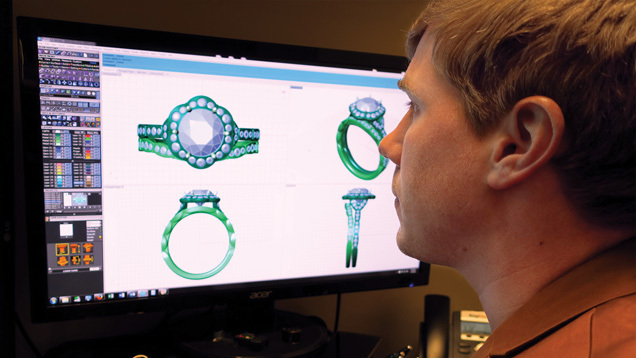 Comprehensive CAD/CAM for Jewelry – Learn the essentials of designing jewelry using computer-aided design software. Offered On Campus in Carlsbad, CA; London; and New York. Jewelry Design – Learn techniques for drafting and painting realistic-looking jewelry, including precious metals and faceted stones. Offered On Campus in Carlsbad, CA; Bangkok; Hong Kong; London; New York; Mumbai and Taipei. Get a hands-on experience with gems and professional equipment in on-campus programs and lab classes. Lab classes are offered at GIA campuses and are one- to five-days in length (depending on the class). They are great ways to learn more about a particular subject, sharpen your skills or fulfill GIA Distance Education gemology program requirements. 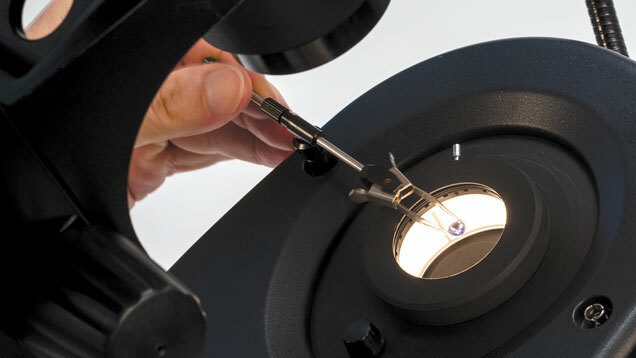 Diamond Grading – Explore how to grade diamonds consistently and accurately. Colored Stone Grading – Gain hands-on practice using actual gemstones and grading a range of colored gemstone important to the market. Gem Identification – Practice methods and skills to identify a wide range of natural, synthetic and imitation gemstones. Pearl Grading – Gain hands-on training and practice testing pearls for authenticity and post-harvest treatments. 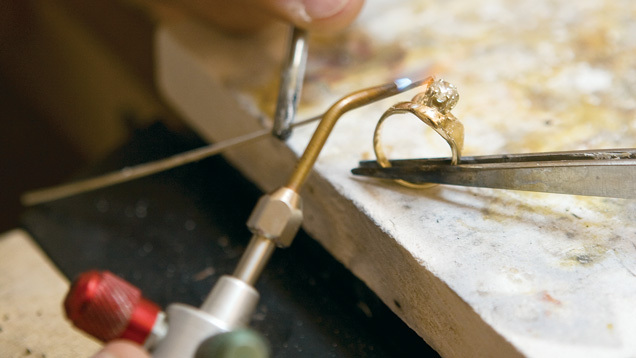 In a jewelry repair and setting lab, students learn to recognize and evaluate quality craftsmanship; identify and set basic mounting styles; size rings, tighten stones, re-tip and replace prongs; assemble and solder heads and shanks; work with sterling silver and white and yellow karat gold. Basic Repair and Setting – A great introduction to the repair and setting skills needed to be a bench jeweler. Students work with precious metals and use modern tools and equipment, including a micromotor and laser welder. Offered On Campus only in Carlsbad, CA. Intermediate Repair and Setting – Develop intermediate bench skills, including: setting faceted stones in a variety of settings, assembling mountings, basic soldering and fabrication techniques, and more. Offered On Campus only in Carlsbad, CA. GIA is offering $2 million in scholarships in 2019 to those who qualify. The annual application periods are February 1 to March 31; and August 1 to September 30. United States armed forces veterans’ education benefits can be used for several on-campus programs. Beyond earning a world-class education, GIA students benefit from a comprehensive support system throughout their career. The GIA Career Services team helps students develop career plans, write resumes and more. GIA Jewelry Career Fairs: The gem and jewelry industry’s largest recruiting events connect students and graduates with dozens of companies looking to hire. Gem and Jewelry Career Center – The industry’s premier online job board exclusively for jobs in the gem and jewelry industry. Research companies, search for jobs, and post your resume and portfolio. 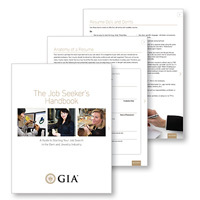 Job Seeker Handbook – Resume, interview and portfolio presentation tips tailored to the gem and jewelry industry. GIA alumni work in every sector of the gem and jewelry industry. 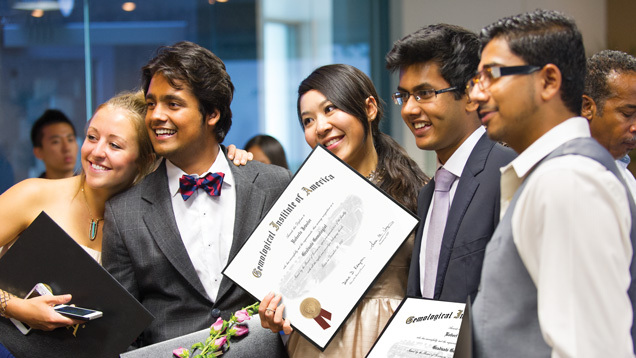 With more than 65 global chapters and over 130,000 members around the world, the GIA Alumni Association gives graduates an invaluable global network for achieving their professional goals. GIA’s campus in Carlsbad is accredited by the Accrediting Commission of Career Schools and Colleges (ACCSC). GIA’s campus in New York is accredited by the ACCSC as a branch of GIA’s campus in Carlsbad. ACCSC’s accreditation is institutional in nature and only includes GIA’s U.S. on-campus education. GIA’s eLearning courses are accredited by the Distance Education Accrediting Commission (DEAC). GIA campuses outside the United States are accredited and/or licensed in accordance with local country requirements. For more detail, see the Accreditation section of each campus’ catalog. For more information about GIA’s campuses, programs and the application process, visit the campus listing page. There you can select the campus of interest and download a campus-specific education catalog. Sed dignissim, nisi sed varius vestibulum, magna orci tempus eros, quis mollis nunc lectus sed mauris. Nulla eget nisi blandit, blandit nibh non, iaculis turpis. Morbi lacus ipsum, commodo at orci eu, pellentesque mattis nibh. GIA is very grateful to the private collectors, who wish to remain anonymous, for the loan of the pieces in the exhibit and their help editing the text and captions. Tsajon von Lixfeld G.G. introduced the collectors to GIA and also provided his expertise for the text and captions. © 2002 - 2018 Gemological Institute of America Inc. GIA is a nonprofit 501(c)(3) organization. All rights reserved.